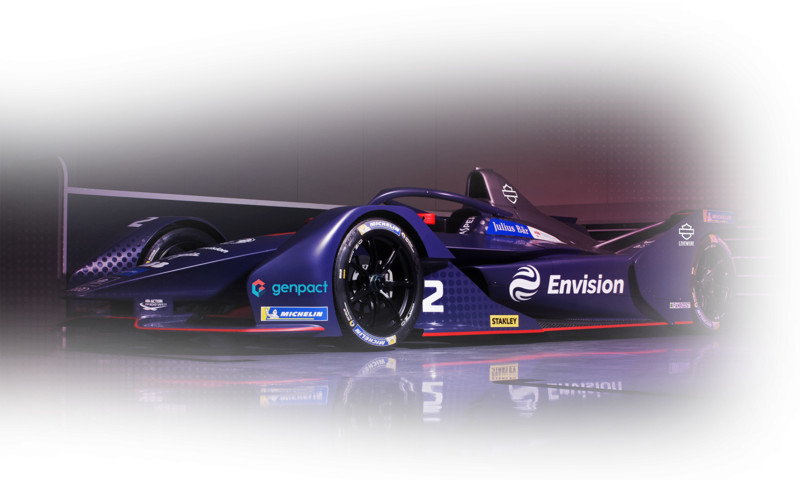 Envision Virgin Racing secured an emphatic double podium during today’s nail-biting Formula E race in Marrakesh, with Robin Frijns missing out on victory by a mere 0.143s – the championship’s narrowest ever winning margin – to earn him his best ever Formula E result. Meanwhile team-mate Sam Bird, who earlier secured his fifth career pole after an incident-packed qualifying session, finished just behind the Dutchman to complete a strong points tally for the team, moving them up to fourth in the standings, with Frijns and Bird now fifth and sixth in the drivers’ championship. After topping the timesheets during last month’s in-season test in Ad Diriyah, expectations were raised heading into the race weekend, held at Morocco’s Circuit International Automobile Moulay El Hassan. The team – who are majority owned by the Envision Group – were not to be disappointed as Frijns finished the opening practice session on top, with Bird just behind in third. Their strong pace behind the wheel of the Audi e-tron FE05 continued into the second practice session with Frijns ending P5. However, a water pump issue for Bird curtailed his session and now meant the team had a race against time to replace the whole of the rear-end of his car before the start of qualifying. A huge team effort meant they did so with eight minutes still to spare, with Bird rewarding their hard work by finishing qualifying P1 and Frijns a few places further back. There was still drama to come following a bizarre pitlane accident as Tom Dillmann reportedly lost his brakes heading into the parc ferme queue and struck the back of Frijns’ car, who subsequently nosed into the rear of his team-mate. This meant Bird entered Super Pole with an off-kilter rear diffuser, but the Brit responded superbly on the final lap of the top-six shootout to claim the top spot. Come the race, poleman Bird was instantly under pressure from Jean-Eric Vergne, with the Frenchman hitting the back of his car in a very ambitious move to gain the lead but instead sending him into a spin. With the two Andretti drivers of Antonio Felix da Costa and Alexander Sims now behind him, Bird had his work cut out keeping it that way, but it wasn’t long before they were both able to find a way passed, dropping him to third ahead of Frijns who had moved up to fourth. At the halfway stage of the 45-minute race, Frijns was now ahead of Bird with a charging Jerome D’Ambrosio also getting ahead of the pair for them to lie fifth and sixth respectively. The next few laps saw frantic racing as the front runners battled for a podium spot until with 10 minutes to go, the two leading Andretti cars collided into one another in a dramatic twist to an all-ready frantic race. That brought out the safety car and when racing finally resumed, there was just time for one more lap resulting in an all-out sprint for the chequered flag with the now leader D’Ambrosio just able to hold off Frijns from Bird.